Women use hundreds of personal care and makeup products, and we now know that much of what is applied to the skin is absorbed into your blood stream. Wouldn’t you like to KNOW what’s in your makeup? Don’t you hate TINY ingredient listings that you can’t read? Wouldn’t it be nice to have a natural foundation that actually WORKS? 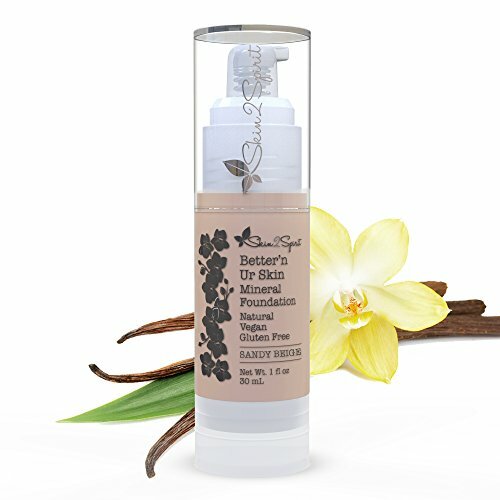 One that covers small imperfections and makes your skin look younger, better, healthier? Color adjusting, All Natural, 90% Organic, Aloe based formula offers beautiful, healthy coverage free of harsh chemicals! Choose a color that is slightly off by a shade or two? It will adjust to your skin tone! Infused with real vanilla! Light coverage, medium coverage, you choose! Buildable formula allows you to apply lightly for a light, natural looking coverage, or layer on more for medium to full coverage. Only skin healthy ingredients that smooth, hydrate, cover and protect, Skin2spirit foundation will make your skin healthier over time. It’s better n’ your own skin! Best applied with our VEGAN CHUBBY FOUNDATION BLENDER BRUSH (check separate listing). PLEASE NOTE: Dark colors will match most medium to dark skin from tan to caramel, the darkest color (Bronze) may not be suitable for very dark skin.